Gathering in our Churches as members of the undivided Body of Christ to celebrate the Sunday of Orthodoxy, we call to mind the holy men and women who defended holy icons, succeeded in restoring them, and pronounced the authentic faith and worship of the Church. Among these heroes of our faith, we commemorate the blessed emperors: Michael, Theodora, and Irene, the holy patriarchs and confessors: Germanos, Nikephoros, and Methodius, and the holy ascetics: John Damaskenos and Theodore the Studite. The reading from the Holy Gospel on this feast recounts Philip’s invitation to his friend Nathanael to come and see Jesus (John 1:46). During his encounter with Christ, Nathanael addresses him, saying,Rabbi, you are the Son of God! You are the King of Israel! (John 1:49). This declaration indicates that Nathanael recognized who stood before him; he understood that the man before him was God, was once prefigured in shadows, now having become human. This particular moment as well as the entire three-year ministry of Jesus Christ helps us understand why the Church uses holy icons in Her worship. Becausethe Word was made flesh, and dwelt among us, we can depict the Son of God, His Most-Holy Mother, and other saints in icons, and through these holy images we extend honor and worship to the archetype. In this light, the effort of the Iconoclasts to remove and destroy holy icons seriously jeopardized humanity’s ability to encounter God. Their efforts, were they successful, would have deprived believers of a window through which we could communicate with God. 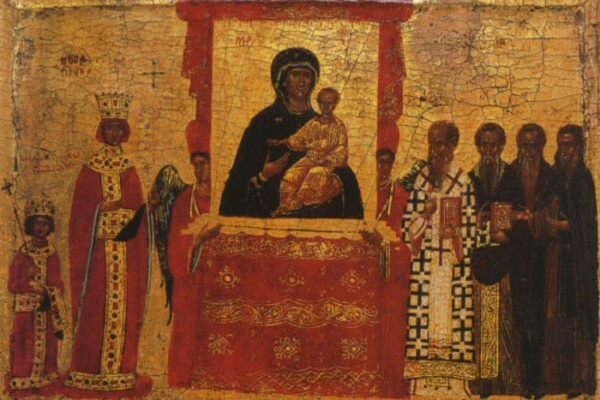 By contrast, the restoration of the holy icons, which we celebrate today, is the triumph of genuine faith and worship in Christ and the assurance that God maintains a profound and immediate connection with the world. Our beloved brothers and sisters, for us Orthodox Christians the presence of icons in our churches and in our homes bears witness to the Incarnation of God and His presence in our lives. Icons also remind us of His invitation to draw closer to Him. Sunday of Orthodoxy and the weeks that follow in Holy and Great Lent help facilitate our effort to become united to Jesus Christ, our Lord. It is our heartfelt prayer that through the veneration of holy icons a doorway to Christ will be opened unto us, permitting us to enter into the fullness of God (Eph. 3:19).